Would it surprise you to know that busy does not equal productive, useful or effective? A busy lifestyle is something the “modern” world has taught us is normal. Normal does not necessarily mean fun, healthy, or productive. For many of us, it means, health issues, physical and mental exhaustion, and constant overwhelm. As a kid, I was busy, always on the go. But, eventually, I grew out of that and enjoyed hanging out with a few select friends, always had my nose in a book and played sports when I could. That all changed in college. Those years were full of busy! Homework, working off-campus as well as on-campus, classes, and more. In my senior year I burned out and I burned out bad. I ended up being short a few credits because I had to drop so many classes. My first job ended up being considered work experience so I could graduate a year later. You would have thought I would have learned my lesson, but no, I didn’t. I didn’t push quite as hard for a while but I always had a side gig pursuing the idea of self-employment. Interestingly, it was this pursuit that finally taught me the difference between busyness and effectiveness. I remember trying a few different ideas in my pursuit of having my own business. Some were a bit more successful than others. Each attempt kept me busy, but none grew to the level of success I had dreamed of. Why? Because I was doing the “busy” work of organizing supplies, ideas, paperwork, researching marketing ideas, and more. What I should have been doing was being more productive and proactive in engaging in honest-to-goodness business building activities and connecting with potential clients. I felt busy and I was with my lists of things I wanted to accomplish. Later I realized I was busy with the wrong kind of work. You feel and are busy so you think you are doing it right and that you are making a difference. That you must be in constant motion, that is just “how it is” now and you are not normal if your calendar is not scheduled 24/7 365 days a year. Speaking from personal experience, I know it is and it’s an addiction that is hard to break. By definition addicting means “to cause to become physiologically or psychologically dependent on an addictive substance” (source). The stress and the adrenaline produced from being constantly busy is quite addicting. The praise and recognition we receive for our busy schedules and long working hours is also addicting. If we slow down too long we might be missing out, we won’t be like [insert name] or we’re not contributing like we feel we should. It feels like we need to get super active again in order to get those feelings back! Busy can keep us blind to our own physical issues that arise from long-term stress and adrenaline production. Both of which can lead to a wide array of health issues from minor headaches to major immune system issues. Being busy is also akin to burying your head in the sand. We can get so busy that we don’t see the family we are ignoring, we might lose touch with friends, and work (both paid and volunteer) becomes our main focus (ask me how I know!). As you can see, long-term busyness is not our friend! So, How Do We Fight Back Against Busyness? First, by examining our priorities. Family & Friends: Time to spend with them and to be there when they need help. Outdoors: Hiking, photography, exploring and re-charging my batteries. Faith: Devotions, prayer, church, encouraging others. Creativity: Creating for fun and creating for my business. So if these are my priorities, how is that showing up in my day-to-day. 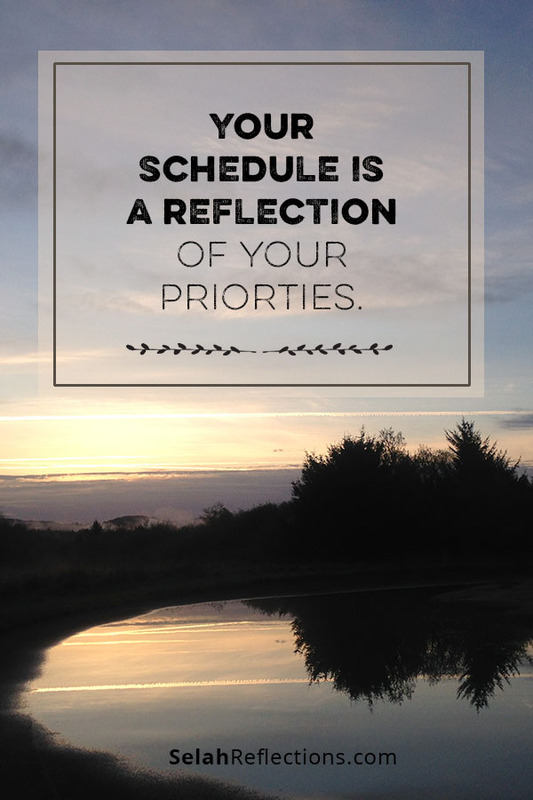 Not all that great, “your schedule reflects your priorities” and right now my schedule is showing a different set of priorities. I’m busy, I work long hours but work has become my top priority and it’s not even in the list above. This is where we all have to start, by taking a good hard look to see if what we say our priorities are aligns with our calendar and actions. Not sure? Ask your spouse, your kid, or a few friends, I’m sure they could tell you right away. I would also like to hear from you, do you struggle with busyness? Leave a comment below or send me an email and let me know what you are currently struggling with. 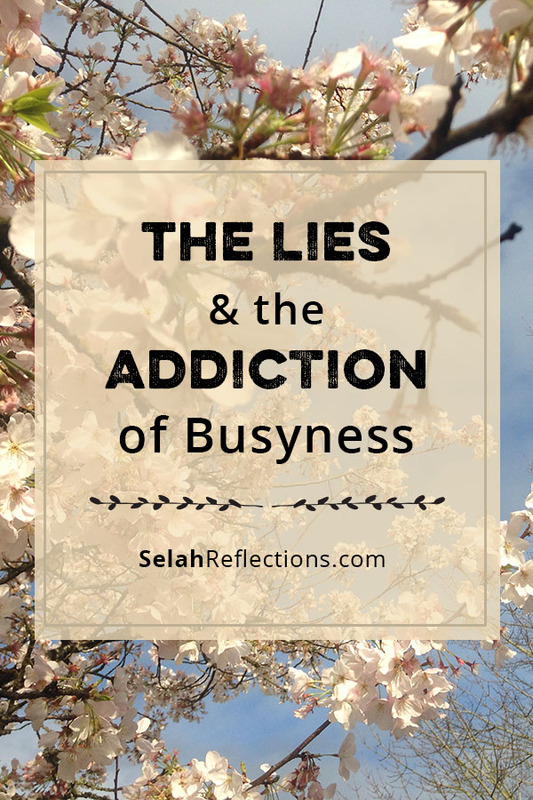 The Lies and Addiction of Busyness Part 2: When does our busyness cost too much? What is busyness distracting you from? I find that my schedule isn’t as busy as before, I’m now an empty nester. But, I struggle w/feeling guilty when I’m not productive each day. I put too much value in who I am as a person by what I do. It’s taking me awhile to have my heart & mind be on the same page! Having an empty nest is a BIG change and one that takes time to adjust to. I think there is room to take time to define productive vs. busyness. I would bet that you are productive it’s just now you have more free time without littles and not-so-littles coming in and out of the house. That guilty feeling is also part of the lies that busyness tells us. That if we are not jam packed to the brim with activity we are doing it wrong or not contributing enough. I hope you can find time to enjoy this transition and see doors opening for you and opportunities that you haven’t been able to pursue before. Not to the point that you are massively busy of course, but enough that you are still feeling productive but adding new joy-filling, soul-filling activities as well. I know that I fall squarely into the “everybody else’s life is crazy and frazzled so I’m not normal if mine is not” category. In our discussion the other day about career and I had taken that test and scored high in the career category, I automatically assumed that since my “career” looks like no one else’s that I was actually failing. The truth is that I am doing what I want to be doing and what is good for our family for this season and it’s ok not to be running around like a chicken with my head cut off. The list of priorities helps because it is a consistent and constant reminder to stay true to what God has for me and what is important for me is not always what is important for others. ..
Good for you Tiffany! The comparison trap is so hard to let go or at least see ourselves comparing and letting it go and being okay with where we are at. And slowing down is NOT a bad thing despite what our friends, family and the world tells us.